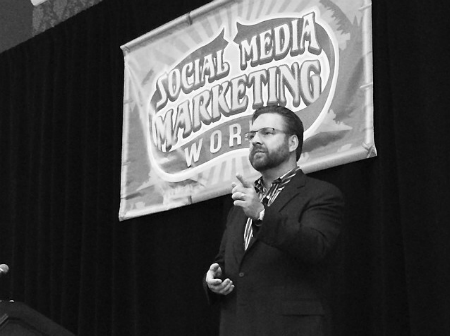 Social Media Marketing World (SMMW14) was quite a ride for over 2,000 people from 40 different countries that attended, especially the team at TopRank Online Marketing. From an opening night reception on an aircraft carrier (The USS Midway) to surfing lessons to over 120 different speakers presenting across 5 to 6 different tracks, this event was one of the biggest mackers of social media conferences. (macker is surfer for “big wave”). I’m happy to share that TopRank was actually the first and sole media sponsor for SMMW14 and our CEO Lee Odden gave a captivating presentation to a packed room as you can see below. Lee’s talk focused on how content plus an influencer network can help grow your business using the SMMW14 conference eBook he co-created with other speakers as a practical example. Both the eBook and the presentation were mentioned throughout the conference by other speakers, attendees and of course the lightning-paced conference Twitter stream. Marketers are increasingly faced with the challenge of proving the monetary value of social media marketing to the C-suite. Since social media is typically less of a sales tool and more of a means of nurturing new leads and maintaining a relationship with current customers, putting a price tag on social media can be a difficult thing to do. The C-Suite will always be concerned with profit, so it’s imperative that marketers can either prove that social media is making their brand money by generating new leads or saving their brand money though customer retention. It appears that Ian Cleary is the King of Social Media tools. With new social media marketing tools coming on the market just about every day, Ian is one of the people you can rely on to test them all – from free to paid. We’re thrilled that he shared his knowledge of tools with us at Social Media Marketing World this year and now I’ll share them with you. As Ian says, don’t sell hot dogs at a vegetarian conference. You have to know your audience before you can market to them successfully. The social tools below will help you identify and engage with active fans, influencers, and industry relevant people to follow. 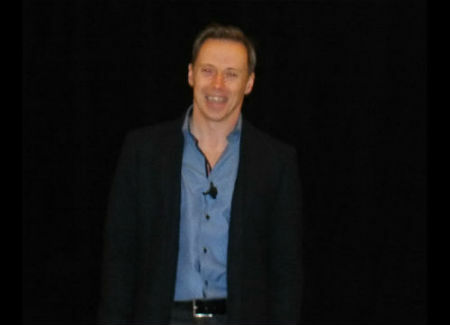 The energy was sky high at Social Media Marketing World this year. Marketers, brands, consultants and business owners from over 40 different countries gathered together to learn about the latest innovations in social media marketing, rub shoulders with social media rockstars, and enjoy unprecedented networking opportunities. Having the event in beautiful San Diego CA didn’t hurt either. In a fast paced, entertaining and metal-infused presentation (the Kiss army appeared on several slides), Jason Miller of LinkedIn Marketing Solutions showed off the compelling opportunities which LinkedIn offers to marketers and businesses at Social Media Marketing World 2014. Your customers are experiencing content shock. Every day there is more content being created than the day before, and it’s up to savvy content marketers to cut through the noise and increase the number of people who view and engage with their content. 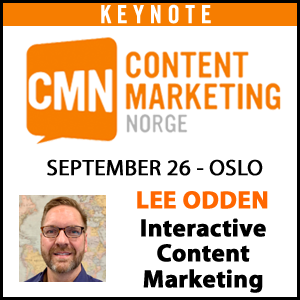 After years of experience, Lee Odden has learned that co-creating content with influential people in your industry can give your brand the visibility that your content needs to succeed. Co-creating content can help you increase the content’s exposure, grow out your social following and increase your brand’s influence. 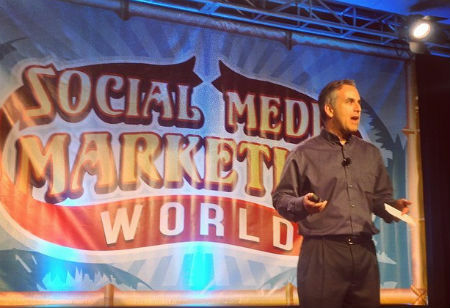 An excellent example of co-created content is the SlideShare presentation Riding the Waves of Social Media: 38 Tips from the Pros that Lee created for this conference: SMMW14. He’s also co-created 36 Content Marketers who Rock for Content Marketing World 2013 because co-created content works! George Carlin famously said, the goal of human beings is to acquire stuff, then to store it somewhere. Unfortunately, many businesses have treated their corporate content the same way, as stuff to be acquired, and used their websites, blogs, and social channels as the places to store it. 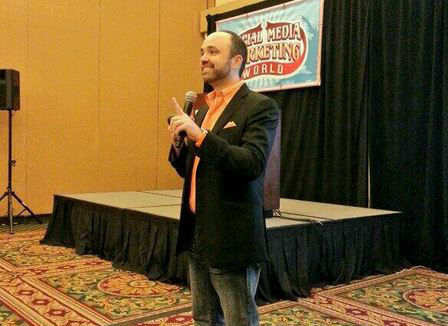 ‘If we only talk about ourselves, we’ll never reach customers’ says the always entertaining Joe Pulizzi in his packed-room presentation at Social Media Marketing World 2014. The answer to this pathological content hoarding problem is content marketing, or at least it was supposed to be. Unfortunately, many businesses are not following important content marketing best practices and are seeing disappointing results because of it. According to research from Content Marketing Institute, 90% of businesses today are engaging in content marketing, but only 45% report it to be effective. What if I told you that you could increase the reach of your social content by a factor of ten by utilizing a resource that you already have? What resource is this, you ask? Your employees. Jay Baer, CEO of Convince and Convert explains that when your employees are satisfied with their job, they become your biggest brand advocates. True advocacy is born from culture, not technology or marketing. Brand advocates, whether they are your customers or employees, appreciate and relate to the culture of your company. Your employee’s happiness can also have a huge impact on your brand’s social media success. In fact, in 2012, 40 of the top companied to work for were also some of the most successful companies in social media. 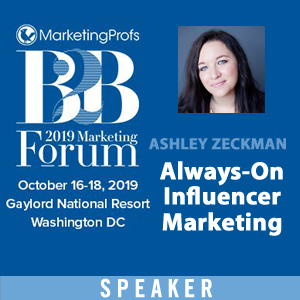 Note from Lee: It is with great joy that I get to introduce new TopRank Marketers to our readers here at Online Marketing Blog. Ever since Brooke Furry joined our team, she has been opening up smiles on the people around her. Turns out, she’s pretty good at getting people to open emails too. Please welcome Brooke as a contributor to Online Marketing Blog! If an email arrives in Judy’s inbox and she never opens it, was it worth the send? Email Marketing is all about the open. Digital marketers who throw their hearts and souls into creating email campaigns with real personality and value know that regular, consistent email campaigns can accomplish great things. But even if you’re sending something you think your target audience will love, who’s going to know, care, or click if you can’t get them to open it? 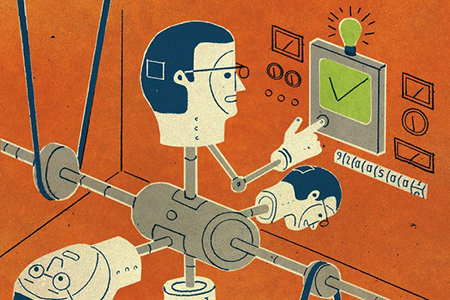 The eternal debate in marketing: Strategy before tactics vs. Tactics to develop strategy. So many companies have become comfortable reacting to industry trends and competitors with tactics, that they end up with wasted effort, poor performance and plenty of frustration. This is especially true in the world of social media marketing as companies roll out social media tactics only to be left wondering in 6 months what the ROI is. Answering Why, for Who and with What tactics is essential for any marketing initiative. A confident and clear sense of purpose is highly motivating and inspires more meaningful and effective marketing.